Rejuvenating a smile to its natural function, health, and beauty not only feels good, but it also encourages essential jawbone stimulation for long-lasting oral health. Because of gum recession, periodontal disease, injury, trauma, genetic factors, or advanced decay, natural teeth may not be able to stand the test of time. Dental health complications such as missing or severely damaged teeth can impact proper jaw function as well as overall quality of life. Periodontist, Dr. Peter O. Cabrera has the expertise for helping patients renew the health, functional, and aesthetic aspects of their smile with top-quality treatments paired with state-of-the-art, specialized care. Our periodontal expert takes great pride in aiming to preserve the overall well-being of your smile with reliable techniques that are durable and long-lasting. If you are looking to restore to its optimal look, feel, and function with dental implants and expert recommendations, our friendly team encourages you to contact our periodontal office in Chicago today! At our periodontal practice, Dr. Cabrera provides expert dental implant placement to support natural-looking restorations. Together dental implant posts and restorations help completely rejuvenate the health, function, and beauty of smiles once hindered by tooth loss or complex dental damage. When Do I Need a Dental Restoration? Though teeth are strong, they can wear, break, chip, decay and fall out even with regular dental care. These conditions can affect more than just your desired aesthetics; they can affect oral health and overall quality of life. A damaged smile can result in infection and loss of bone; other problems may cause a shift in your bite's position and comfort, possibly spurring-on other issues such as TMJ and jaw-related pain. The good news is that with top-quality restorations, these dental complications can be easily treated. If you have one or more that is severely damaged or missing within your smile, be sure to contact our office to discover which restorative option will best suit your needs. By taking the time to establish strong communication and thorough understanding, we can provide personalized and comprehensive care. This helps our periodontal specialist determine the ideal restoration option for your smile, and how many dental implants need to be placed for your prosthetic to stay secure and long-lasting. What’s the Difference Between Traditional and Implant-Supported Restorations? While both traditional and implant-supported restorations utilize crowns, bridges, dentures, and partials, the difference is in which method is used to keep them secure. Traditional restorations like dentures, bridges, and partials are often considered removable as they typically rely on natural suction and adhesives to stay in place as they rest on the gums. And traditional crowns are cemented onto a damaged tooth, encompassing the existing structure. Implant-supported restorations are just that. They are supported by one or multiple dental implants that restore essential stimulation to your jawbone while offering a strong foundation for your restoration that lasts. With accurate implant placement from Dr. Cabrera, your implant-supported restoration will not slip, slide, or become dislodged so that you can smile with renewed beauty and peace of mind. A dental crown is a restoration that replaces the top, visible part of the tooth. When a single tooth is missing or is so severely damaged that it must be extracted, it needs to be completely replaced and can be fully- restored when affixed to a dental implant. The crown is supported by a titanium implant post that serves as an artificial tooth root which is surgically implanted into the jawbone. The implant secures the crown in place, ensuring a sturdy fit and keeping your new tooth and surrounding teeth from shifting out of position. An implant-supported crown is designed to mimic the natural shape, size, and color of your teeth, giving you a beautiful smile that’s sure to last. A bridge is a restoration ideal for replacing two or more missing teeth in a row. Although there are many forms of this type of restoration, bridges supported by dental implants are often the strongest option for a multiple-tooth restoration. They also provide many advantages over other options. Common restorations like fixed bridges or removable partials can cause the surrounding bone to weaken because they are dependent on neighboring teeth for support. Implant-supported bridges fuse with the natural tissue and bone, providing a much stronger and more natural restoration. An implant-supported denture is a type of overdenture (a removable partial denture or a complete denture that covers and rests on one or more remaining natural teeth, the roots of natural teeth, and dental implants) that is supported by, and attached to, implants. A regular, traditional denture rests on the gums and is not supported by implants. An implant-supported denture is used when there no remaining teeth left, but there is enough bone in the jaw to support implants. An implant-supported denture has special fixtures that snap onto attachments on the implants. They hold the denture securely in place by anchoring them to the jawbone. These dentures can either be removable or fixed, depending on the preferences and needs of the patient. The placement of an implant immediately after tooth extraction offers reduced treatment time and increased patient satisfaction. First introduced in 1976, immediate implants now have survival rates similar to delayed placement and are an increasingly popular way to replace missing teeth. “Immediate loading” involves placing the implant within 48 hours of tooth extraction and the placement of a temporary crown. This temporary crown is carefully shaped. The crown is there for aesthetic and protective purposes and should not have any hard pressure put on it. This means you must agree to a soft diet and to take extra time and effort to care for the area around the implant after the first couple of months following surgery. CT scanning technology helps Dr. Cabrera precisely place implants in the jawbone, and special tools measure the amount of force put on the implants during placement. These technologies allow us to place implants in the correct amount of healthy bone promoting more effective and faster healing. After placement, fusing in a process called osseointegration takes place. Natural bone tissue in the jawbone grows on and around the implant post and forms a direct connection, holding it firmly in place. The process takes a few months, and it is important to minimize the action on the implant during this time. At our periodontal office, we can provide a comprehensive evaluation and help you determine if this treatment option is the best one for you. Why Should I Choose Dental Implants for Restoring My Smile? Consisting of body-safe titanium, dental implants are posts that serve as artificial tooth roots which fuse with living tissue and bone. Because of this process known as osseointegration, dental implants provide your jawbone with the essential stimulation it needs to remain healthy and strong. This not only benefits your oral health, but helps preserve natural facial features, dental function, and enhance the overall quality of life. 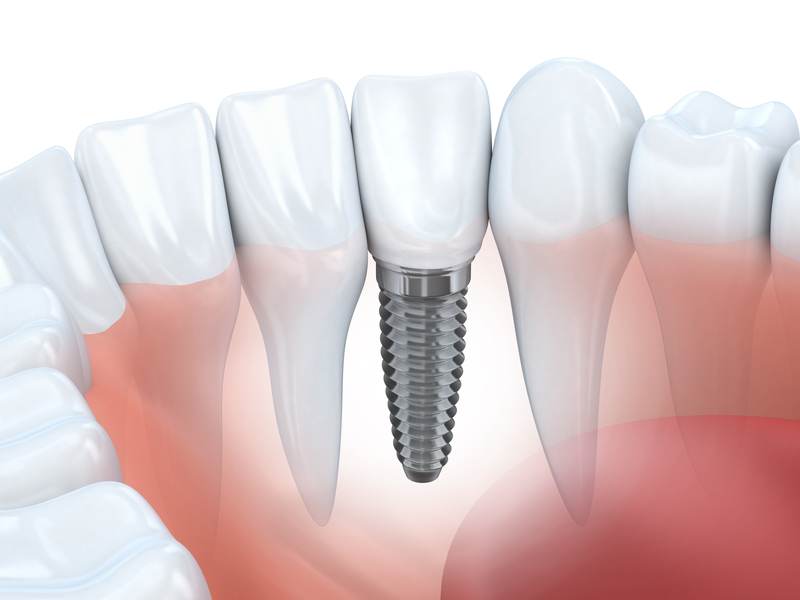 Dental implants are the most permanent and secure form of tooth replacement. They are reliable and versatile as they can be used to replace a single tooth, multiple teeth, or up to an entire arch of missing teeth. When the restoration is attached to the implant, the missing tooth or teeth are completely restored. Ideal candidates for dental implant treatment must be in good oral health and should have enough jawbone volume to support implants which will allow for proper healing. During your detailed consultation, if it’s determined you lack proper jawbone strength due to prolonged tooth loss, there is a chance that your jawbone has weakened and shrunk to the point where implant placement might not be an ideal solution without initial procedures to help, such as a bone graft. Fortunately, Dr. Cabrera offers bone grafting to help restore your bone to significantly increase your chances of receiving dental implant treatment. Ready to Rebuild Your Smile to Its Optimal Potential? Contact Us! As one of your most prominent features, our periodontist is dedicated to rejuvenating the health, function, and overall well-being of your smile. Dr. Peter O. Cabrera and his team proudly offer initial restoration treatment with dental implants at our Chicago office. We happily serve the tooth-replacement needs of patients throughout Chicago including Lincoln Park, The West Loop, Lakeview, and other communities of Cook County. Call us today for your consultation!